Sugar snap peas are flat pea pods that grow during the cool season. They are crisp and have a sweet flavor, and are often eaten steamed or in stir-fry dishes. Beyond the texture and flavor of sugar snap peas is a wealth of vitamins and other nutrients that help to improve the health of the heart and bones. Sugar snap peas are also convenient to grow and store, making them an inexpensive and beneficial vegetable option. Sugar snap peas contain many vitamins that offer benefits for the entire body. They are a source of vitamin K, which activates osteocalcin and helps keep calcium in bones. They also contain vitamin B6, another vitamin that improves bone health by reducing the buildup of molecules that can cause osteoporosis. Sugar snap peas are a source of vitamin C, a nutrient that protects DNA structures from damage and improves the immune system. 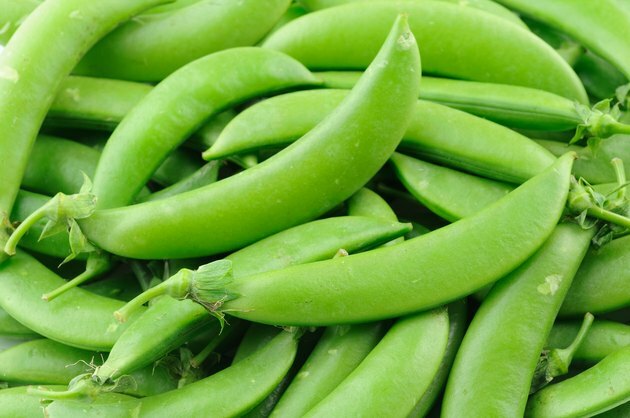 Folate is also found in sugar snap peas, which helps to improve heart health. Low levels of folate can raise levels of homocysteine, which increases the risk of heart disease. Sugar snap peas are a source of iron, a mineral necessary for normal blood cell formation. Adequate intake of iron helps to prevent conditions such as anemia and fatigue. The peas are also a source of beta-carotene, which is an antioxidant that helps protect against the growth of cancer cells. Sugar snap peas are beneficial for dieters. The peas are low in calories, containing less than 70 calories per half cup. The high amount of fiber makes them a filling snack or side dish. Sugar snap peas are also easy to grow. According to the University of Illinois Extension, they thrive in cool and moderate climates. They last two to three days in the refrigerator and can be frozen for later use.